Welcome back to the game, folks! We're here in the top of the second inning, but before we get things going, we have a little business to attend to. Voltaire came up with the answer to the last trivia question: Which hall-of-famer once donned a Cleveland uniform because his was missing? It was Ty Cobb! 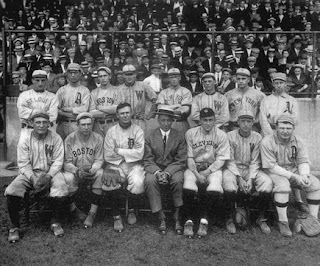 During 1911, an all-star benefit game was held in honor of Addie Joss. According to most accounts, it was the first all-star game in major league history. One story says that Cobb's luggage was lost, so he had to play in the Indians uniform, while another tale reports simply that Cobb had forgotten his outfit. Either way, for one fleeting moment, Cobb was an Indian. Want a picture? Okay! Cobb is in the front row, third player from the RIGHT - the one in the "CLEVELAND" uniform! For his research prowess, or general baseball knowledge, Voltaire is the winner of a 2000 Pacific Paramount Holo-Gold Vladamir Guerrero (serial #101/199 card 142)! Way to go!! Let's get to some dusting - scratchcard dusting that is! Dayf's Braves jumped out to an early lead, and held on as Erin's Orioles were not able to score any runs in the first inning. Braves fans are clapping, cheering, making all kinds of noise as the next set of batters comes into the game! Leading off the second inning, Number 06 comes up to the plate. The pitcher seems pretty upset that her team is still behind. The first pitch is WAY inside, and brushes the batter out of the box. The umpire gives her a warning. The next pitch is a fastball over the plate, and the batter fouls it off. The pitcher sets up... Here's the pitch... strike two. The pitcher is ahead in the count 1-2. She fires off the next pitch and sends the batter down looking. The first batter came up empty, but Dayf is unaffected. He leads by three and sends in Number 17 to try and build an even bigger lead. The pitcher can't quite find the zone on this batter and she walks him. The Braves have a runner on and one out. It's still early in the inning as Number 25 takes his place in the batter's box. The pitcher throws... Whoa! The batter lays down a bunt! The catcher jumps up to get it, but cannot throw the runner out in time! Two men on base now present a real threat to the Orioles. Number 27 comes out of the dugout and tips his hat to the crowd. He's got a lot of fans here today! Let's hope he can give them what they came for... The pitcher gets her sign. She checks the runners, turns and fires the pitch! The batter swings in what looks to be more instinct than aim, and he hits it! The ball takes a funny bounce off the mound, sending it to the outfield for a base hit. The Orioles have pitched themselves into a bases-loaded situation. Can their pitcher get them out of it? Will Dayf's next batter capitalize here? Let's see if Number 01 earns his pay today. OH! The batter may not be earning his pay, but the pitcher sure did! She sends the batter back to the dugout on three pitches for a 1-2-3 strike out! Two outs, bases loaded, and the last batter for this go-round comes up to the plate. Number 16 is feeling the pressure. Here's the pitch... The batter swings and sends the ball into the air above the center fielder. She easily makes the catch to keep the Braves stranded on the bases! The Orioles escape the bases-loaded situation. Leaving the bases loaded in a championship game... Yup, I'm definitely the Braves. I bet that was Lonnie Smith stranded on third.